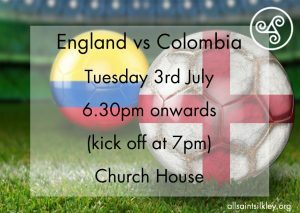 Come and join us in Church House on Tuesday evening to watch England vs Colombia. Come along from 6.30pm for a 7pm kick off. Soft drinks will be provided but please feel free to bring any snacks or food along too. All welcome!